The Basler pulse cameras offer good performance at an amazing price, and this model is no exception. 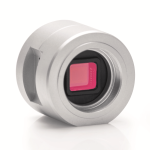 Built on the Aptina MT9P031 CMOS sensor, it has 2.2 micron pixels. The rolling shutter maximizes sensitivity. The compact but robust metal housing is both elegant and practical. The CS lens mount is easily converted to C- or S- mount for mechanical compatibility with most lenses. There is a USB3 Vision connector on the housing’s side. The 1/4-20 tripod mount is built in. And it weighs just 60 grams. As with all Basler cameras, there is great software support from both Basler and third-parties. Communication is via the USB3 Vision interface – nothing proprietary here. The free Pylon software suite can configure the camera, display and save images, and provides a comprehensive API for developers. This camera is a great choice when size, weight, power consumption and price are critical design factors. Effective sensor size is 1/3.7 (4.84 mm) contrary to that indicated above. There are no electrical I/O for interfacing with trigger or strobe light. If you need these, please see the Dart cameras. To use with a Basler C-mount lens, purchase the LSBR900 extension ring. To use with other C-mount lens, purchase the LSKA901 extension ring.